The sign reads "FOR SALE BY OWNER." A buyer calls, and an agreement is made to buy the property. The parties agree to leave the real estate brokers and lawyers out of this. It's a simple transaction. There's no need to pay commissions and attorney fees. Of course the buyer wants a general warranty deed. The seller readily agrees. After all, the general warranty deed is what everyone uses. 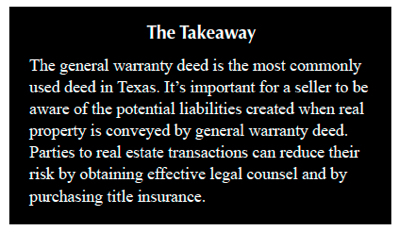 The contract forms promulgated by the Texas Real Estate Commission even require a general warranty deed. That's how it's done. The seller does a quick Internet search and finds a form for a general warranty deed, quickly fills it out and signs it, delivers it to the buyer in exchange for a check, and deposits the check. On the way home, the seller congratulates himself for saving money. Little thought is given to the legal mumbo jumbo contained in the deed. This scenario plays out all over Texas, and countless buyers and sellers put themselves at risk of being left holding the bag. They are, of course, free to do so, and brokers and lawyers are not required. Although the most common deed in use in real estate transactions is the general warranty deed, the parties to the transaction rarely know the legal ramifications of its use, especially when real estate professionals, lawyers, and title companies are not consulted. Participants in real estate transactions should know what it means to sign (and accept) a general warranty deed. Generally speaking, a deed is an instrument that conveys an interest in property. 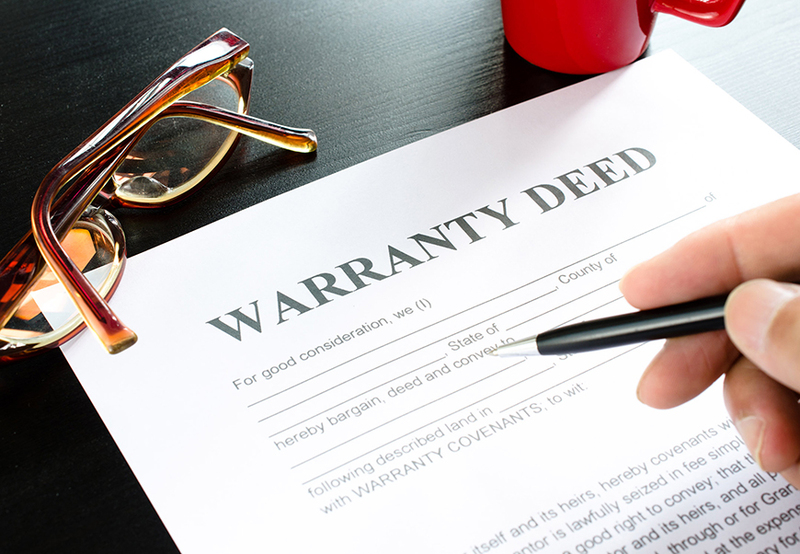 While not all deeds contain warranty language, certain warranties are implied in almost every deed. The Texas Property Code provides that any time the words "grant" or "convey" are used in a deed, the grantor (seller) promises 1) that the grantor has not transferred any part of the property to anyone else, and 2) that the property is free from encumbrances (Section 5.023). The implied warranties are made only to the grantee (buyer) in the deed. That is, they are not attached to the land. Only the immediate buyer may sue the grantor if the warranties are breached. Express warranties are stated specifically in a deed. They are similar to implied warranties, but they give greater protection to the grantee and subsequent grantees, and they expose the grantor to greater liability. And ​grantor hereby binds grantor, grantor's heirs, executors, and administrators to warrant and forever defend all and singular the said premises unto the said grantee, his heirs, and assigns, against every person whomsoever, lawfully claiming or to claim the same, or any part thereof. What does this mean? It means that the seller is guaranteeing to compensate the buyer for any failure of title, all the way back to the time of the land patent from the sovereign. In Texas, that means the original grant from Spain, Mexico, the Republic of Texas, or the State of Texas. Additionally, this warranty is appurtenant to the land, meaning that it is attached to the land and "runs with" the land. In other words, the seller's guarantee is made to the buyer and to all subsequent grantees, and includes all title defects, even if the seller had nothing to do with them and had no knowledge of them, and even if they originated over 180 years ago. When a general warranty deed is given, the grantor promises that 1) the grantor will defend and protect the grantee against the rightful claims of third parties to the property (warranty of title), and 2) the property is free of encumbrances (covenant against encumbrances). An encumbrance is any impediment to the title that does not change the ownership of the land, but that diminishes the value or use of the land. Examples include liens, tax assessments, leases, and easements. Note the similarities and differences in the implied and express warranties. The implied warranty extends only to the immediate grantee and only says that the grantor has not previously conveyed the property to a third person. The express warranty goes much further. It extends to all subsequent grantees and covers every potential defect in the title. A warranty does not strengthen or enlarge the title conveyed. It does not even guarantee that the grantor owns the property. It simply promises to compensate the grantee in the case of a failure of title. The seller may have previously conveyed part or all of the property to a third party. A previous owner may have previously conveyed part or all of the property to a third party. A third party may have adversely possessed the property prior to the date of the transfer of the property. A third party may have obtained title through a separate chain of title. A failure of title may be total or partial. A total failure of title occurs when no interest in the property passes to the grantee as a result of the deed. A partial failure occurs when only part of the property interest passes to the grantee. In the event of a total failure of title, damages are the purchase price paid the grantor, with interest. In the event of a partial failure, the damages depend on the circumstances. If title fails as to a certain part of the land, then the damages are calculated by determining the value of the part to which title fails in proportion to the value of the entire tract, and then multiplying the resulting fraction by the purchase price. If title fails as to an undivided interest, damages are calculated by dividing the price paid to the grantor for the entire tract by the number of acres in the entire tract at the time of the conveyance to obtain a price per acre and then multiplying by the percentage of undivided interest for which title failed, unless the value of the failed interest is affected because it is an undivided interest. If the grantee obtains full title by purchasing the outstanding interest from a third party who is the lawful owner, the buyer may recover the price paid for the outstanding interest, but these damages are capped at the price paid to the grantor for the entire tract. A grantee may also recover other costs, taxes paid, and attorney fees. Encumbrances include liens and tax assessments. Easements or restrictions on use may also be encumbrances. However, easements and restrictions are often excepted from the warranty. An example of a breach of the covenant against encumbrances is the existence of a lien on the property. The breach technically occurs at the time the covenant is made. However, the buyer may not sue until 1) the lienholder forecloses and takes the property from the buyer, or 2) the buyer pays to discharge the lien. In this event, the grantor may be sued for the cost necessary to discharge the lien or encumbrance. If the breach is based on an impediment, such as an easement or restriction, the damages are the difference in the value of the property without the impediment and the value of the property with the impediment. These values are calculated at the time of the transfer of the property. There are several common ways the parties to the transaction may allocate the risk involved. And grantor hereby binds grantor, grantor's heirs, executors, and administrators to warrant and forever defend all and singular the said premises unto the said grantee, his heirs, and assigns, against every person whomsoever, lawfully claiming or to claim the same, or any part thereof, by, through, or under grantor, but not otherwise. The effect of this warranty is that the seller is liable only for claims that arise through him. Of course, this shifts the risk to the buyer should some other failure of title occur, so a buyer may be reluctant to accept a special warranty deed. Another type of deed, called a deed without warranty, eliminates the express warranties altogether. Implied warranties still exist unless the deed expressly disclaims them. Deeds without warranty are uncommon in real estate sales. Usually, a deed has a section entitled, "exceptions to conveyance and warranty." Known and existing encumbrances are listed here and specifically excluded from the warranties made in the deed. Title Insurance. A real estate broker or salesperson is required to advise each buyer that the buyer should 1) have the abstract of title examined by the buyer's attorney, or 2) obtain a title insurance policy. Buyers would do well to listen to this advice. Title insurance may be purchased to protect the buyer from defects and encumbrances. When purchasing title insurance, it is important to remember a few things. First, even though the title policy is often paid for by the seller, title insurance typically protects the buyer (an owner's policy) or the lender, if any (a loan policy). The buyer (or lender) is the insured, and if a valid claim is made, the insured gets paid. This is much better for the insured than suing for breach of warranty. After all, the seller could be nowhere to be found or judgment-proof (broke). No legal protection is provided to the seller. In fact, if a claim is paid, the title company is subrogated to the insured's rights, meaning it could seek to recover from the seller. However, as a practical matter, title insurance is good for everybody, including the seller. Second, the title policy only covers the property for as long as the buyer owns it. Once it changes hands, the general warranty still applies (runs with the land), and the original seller is still on the hook. Third, title policies come with numerous exceptions, which help the title company avoid liability. Many of these exceptions may be changed or deleted by paying an additional premium for an endorsement. Ask your title company or lawyer about other options for additional protection. One pleasant side effect of title insurance is that defects may be discovered (and often corrected) during the title examination process, significantly reducing the likelihood of a claim. However, one should remember that the title company examines the records to protect itself. It does not have a duty to inform of defects. If a defect occurs, the title insurer's duty is to compensate for loss or damage, up to the face value of the policy. The insurer also has a duty to defend as set forth in the policy. 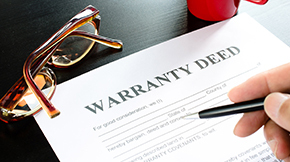 For specific warranty deed advice, an attorney should be consulted. Adams III (radams@mays.tamu.edu) is a member of the State Bar of Texas and a research attorney for the Real Estate Center at Texas A&M University.